You Need to Wear Shades in the Wintertime too! Home » What's New » You Need to Wear Shades in the Wintertime too! It's official! Winter is here, which means in some areas biting winds and frigid rains and sometimes snow aren't far behind. You wouldn't ever contemplate of leaving the house without a coat in freezing conditions, but surprisingly, a lot of people don't think to put on their sunglasses. While many of us aren't thinking about the glaring sunshine during times that we are bundling up against the bitter winter climate, the sun's rays are still shining down in colder climates, and in many instances can be even stronger. For times when you live in or plan to visit a location with snow, you should be even more careful. Particularly following a serious snow fall, the blanket of snow covering the world around you, actually magnifies the reflection of the sun's rays. In fact, without sunglasses it can be painful to open your eyes when you first leave the house after a fresh snow. The ultraviolet exposure that many of us are so vigilant in avoiding in the summer months may really be more hazardous during the winter because it bounces off the snow or ice, giving you a second exposure. This is why proper sunglasses are a necessary part of your winter attire. Although it's important to feel great in your sunglasses, the most important consideration when choosing sunglasses is being certain they will properly protect your eyes. Make certain your sunglasses block 100 percent of UV light by checking for an indication that they are labeled UV 400 (this means they block all light with wavelengths up to 400 nanometers, which includes both UVA and UVB rays.) 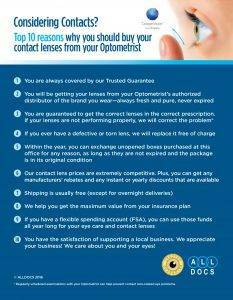 The good news is proper protection for your eyes isn't necessarily expensive. Dozens of reasonably priced brands are made with complete protection. Another important consideration in picking the right sun wear is lens size. You will have the most protection when the lenses completely shield your eyes and if possible the surrounding areas as well. The larger the surface area covered by your sunglasses, the less harmful UV rays will be able to enter. Lenses that wrap around the temples will also prevent radiation from entering through the sides. For the skiers or snowboarders out there, you should be aware that UV radiation is stronger at higher altitudes, so be particularly careful to guard yourself on the hills. Another way to add extra protection is put on a protective hat with a wide brim or visor. This wintertime, stay warm and keep your eyes safe! Make your sunglasses a fixed part of your routine.